So today I've decided to break out my new denim dress, which you may remember I was deliberating over which style to buy here. No surprises which one I went for....yup it was the Topshop one!! And whilst the weather might not be quite hot enough or my legs brown enough (think blindingly white - sunglasses required!!) to go bare legged, I've thrown on a pair of navy opaques just to avoid causing anyone an injury, although I must admit I can't wait to team it with a pair of gold sandals come the summer. I also fancied wearing some more pearls today & dressing up the casualness of the dress, so have thrown on my faithful Zara necklace, which is just a great necklace for going with everything. And in case you fancy recreating all or part of this outfit, here's my suggestion on how to shop my style! So what do you think? 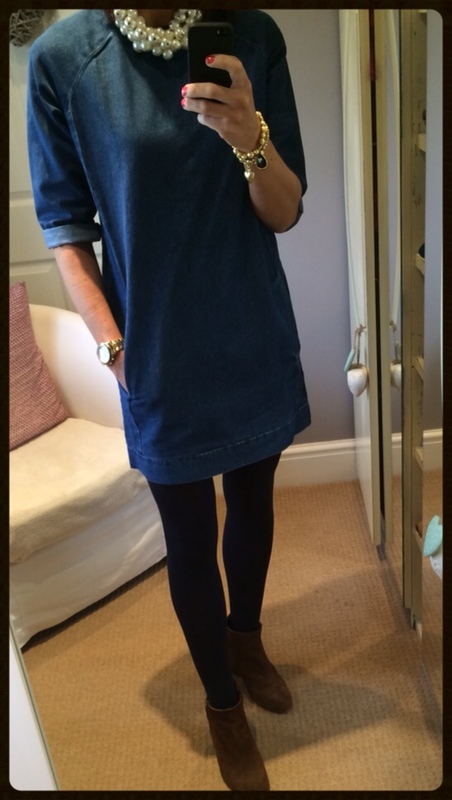 Have you found your perfect denim dress yet or are your still on the hunt? Perhaps you've got it safely tucked away in your wardrobe but are waiting for even warmer weather to break it out? I'd love to hear from you & whatever you're up to today have a good one as the weekend starts here!!!! Ooh I can't wait to see how you style yours Annmarie. I've had my mac for 10+ years but it's just one of those great buys that never goes out of fashion & is so easy just to sling on! Thanks Sharron, I'm looking forward to seeing how you style your gorgeous M&S one. I have a good one I found that I need to wear again - thanks for inspiring me! 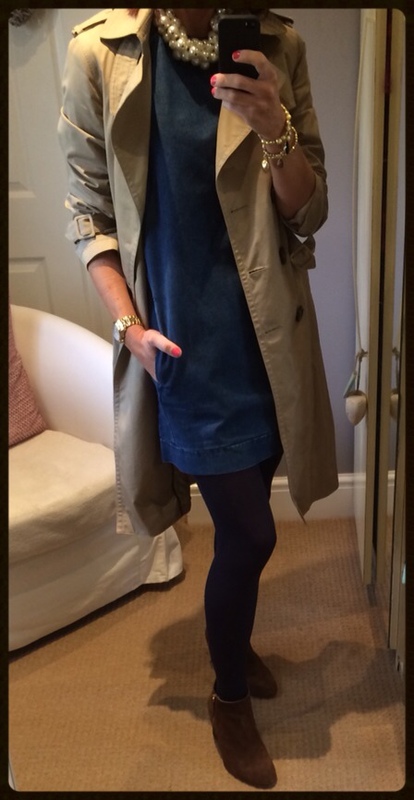 I love you in your denim dress Fiona, you definitely need to get it back out for another airing. Aww thanks Lynne :-) It's such an easy dress to wear! Thanks Sian & yes I can't wait to team it with some gold & leopard print sandals come the warmer months. Yep - got mine! And now I have two. And three if I count the maxi which I don't wear! I also love seeing how people wear the same item and style it according to their tastes. Can't wait to see how you style yours Sue! Thanks Michelle, I must give it a bash with the New Look necklace from last year too! Thanks Avril, I think it's going to be a real staple! Lol Andrea, quick get some before all the winter stock goes! !